So, I wanted to ask you all a couple questions and mention a couple of other things. I want to start off by asking; What do you think about how you enter my giveaways? Would you prefer to keep it so you comment, or Google Forms? I know that Google Forms can be faster, so I just wanted to get everyones take on it. C- Doesn't matter to me. I'm sure you've all noticed the lack of posts. I'm not sure why, but lately I haven't been hearing back from many companies :(. I just recently got in touch with a few great companies, so I have some great reviews and giveaways to look forward too. Until they get here though it's going to be a little slow. I've been trying to make up for it with movies posts and such. I also have some good news. I just.. applied to college!!! Yes! I am super excited. I haven't heard anything back yet, but I just did it like, I think 4 days ago, so just recently. I am hoping to be in school Summer 2011! I'm a little nervous, but ready! I wanted to take a second to thank Tannawings. She is super, and really played a big big part in inspiring me to do it :) Thank You! Another thing you may notice in my blog very soon is the incorporation of the rats. I mean.. my blog is called "My life with RATS and more." 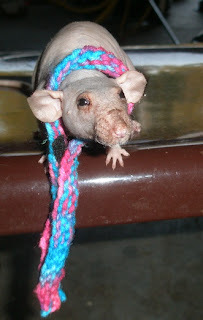 I just recently ordered a new camera (I got it already but the one I got.. was disfunctional, so I am just waiting on a replacement) so with the new camera I am planning on taking lots of cute pictures with the rats :). I think it will make the blog more fun, and I hope you'll all enjoy it too :)! Well.. Thats it for now.. but like I said.. More posts coming soon! Hey, it's ok if you don't have a bunch of giveaways going all the time. I enjoyed your movie posts and your weekend in pictures was very cool! Yay,collage..that's great,i am so glad you were inspired,i noticed from her comments...Tannawings is a sweetie! About the way we enter the giveaways i would choose (c) it doesn't matter to me,if it is a contest i want to enter i will take the time out to enter which ever way. It should be easier for you though because i know when you have big giveaways it can be a little overwhelming with all of the entries. Have a great week girlie!! ahhh i meant college..hmmm maybe i need school again!! I agree with Crystal, to me, however you want to do things is just fine by me. Aww Amanda, it's all you... you stood up to your boss (and their bosses) not too long ago, and you had it in your head to go back to school. It was one door closing and another one opening :) I am so proud of you that you finally got that application in & you're going to college! Looking forward to the new rattie pics! You will be taking pictures of everything- hey did you get any of that supermoon the other night? I saw a few from people who lived near the ocean like you do and they were gorgeous! Congrats again on getting the app in, I will be cheering you on whether it is this summer or this fall! I like B comments - it is easier for me when i get busy or sidetracked or confused to look back over the comments and know if i already voted for Lil Luis that day or the day before or which extras i did or did not comploete and comment on. Looking forward to more rat photos. Congrats on applying to college! I like (B) Comments. But whatever you choose is fine with me! The forms may be faster, but they are not nearly as engaging as the questions you ask for as comments! Thanks to one question, I now know the names of a missing family of children from my city. And I like voting for Lil Luis :) I will continue to enjoy your site whatever you choose, but my two cents goes toward keeping the comments. Thanks and great luck with school. I prefer forms, as they're much faster and I can always leave a comment to remind me which contests I've already entered. I prefer comments, but whatever you want to do is fine by me. As for giveaways, either is fine by me, but I have to say that comments make it easy to see what entries I've already completed. I guess if you decide to do the forms, all entries will be in one form, so it doesn't matter either way! Giveaways - C - Doesn't matter to me which way you go. What's easiest for you? I recall you were a bit overwhelmed by comment entries at one point. Would using Google Docs make it easier for you? Congrats on enrolling for college. About the giveaways, I like comments but I guess it doesn't really matter. I'll still enter either way, but my preference is comments. Helps me keep track of what entries I've completed. Congrats on applying for college. What field are you going to study for? My preference is comments, but if using forms is much easier on you then that's what you should do! Congrats on your applying for college! BTW For giveaways I prefer forms - it's faster! I love the pictures of your pets :) And as far as giveaways go, I like the Google forms. It's so much easier than multiple comments. Oh, and the college application-that is AWESOME! I only have an associates right now, but I'm working toward a BS-best decision I ever made! I did some reading prior to receiving this this product. I read that while gets your cloth diapers super clean, it sometimes may need a few soaks to really get the gunk of other detergents hanging on and any smell out.